Elsewhere it was a weekend to forget with defeats in both cup competitions for the seconds and thirds along with defeats for the u20’s and Womens team. 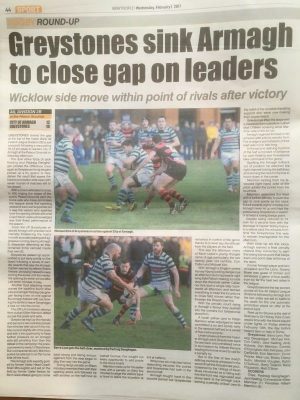 The seconds went down 3 – 36 at home to Terenure in the Met Cup while the thirds suffered a heavy defeat to Old Belvedere in the Winters cup. The u20’s and Womens both visited Barnhall on Sunday each coming away on the wrong side of the scoreline, the 20’s going down 31-3.